Few things are impossible for a skilled developer with time and determination on their hands. This is how we've gotten to see smartwatches run Counter-Strike, Windows 7, and other software whose presence on a wearable is downright illogical. But Windows 10 (or what could actually be a very elaborate simulation of Microsoft's mobile OS) running on a Nexus 5x surely feels more at home. The Google–LG masterminded device has all the hardware needed to make an example of the platform. After all, the smartphone is spec'd close to the Microsoft Lumia 950, complete with the same Qualcomm Snapdragon 808 chipset. The Lumia 950, however, has a Quad-HD resolution AMOLED display and more RAM memory. Unfortunately, we have absolutely no idea where you can get your hands on a Windows 10 ROM or launcher for the Nexus 5x. The operating system hasn't been made publicly available, Microsoft won't be porting it to a non-Lumia device anytime soon (although Xiaomi handset owners might be in for a surprise), and the video is ripe with mistification as a whole. That's too bad, for the Nexus 5x would make for a killer dual-booting Android/Windows handset. The dual-booting concept was picking up steam a couple of years ago, as manufacturers were keen on introducing Android and Windows-running smart devices. But it is alleged that Google and Microsoft put the kibosh on their aspirations, for reasons that shall remain hidden between the walls of their Silicon Valley offices. Oct 20, 2015, 7:48 AM, by John V.
Nov 24, 2015, 10:01 AM, by John V.
a good way to waste 16GB/32GB non-expandable storage..
Dual Booting Android and Windows makes perfect sense on a SmartPhone PC (128GB storage at least). This is where Intel's Dual OS chips from 2014 will be welcomed by me: http://www.engadget.com/2014/01/06/intel-unveils-dual-os-platform-that-runs-android-and-windows-o/ Windows 10 Mobile is developing to the point where I'd be fine using it alone, but until it gets there it's most rational to have Android just a system reboot away. In fact, I think that should partly be Microsoft's solution to becoming popular; make Windows 10 Mobile drivers for a vast array of Android devices, with support for Multi ROM on the Play Store. With IBM's previously announced PCM chips, boot time could be as negligible as putting the device to sleep and waking it up. It's not short sited. Besides if you want the look and feel of Windows, then Android already allows you to install home screens and launchers that look and feel like Windows Phone/10 Mobile. There is some launchers that will rotate your pictures on a tile, even put you messages on tiles, and you can size them as well. Plus if you are running Android, then you can still use Cortana and use the better Google Now. Plus you have access to more browsers, you can still use MS office products, and Google products. Not to mention all the other tools and utilities, and other apps not even found on Windows. Sure you are missing a few things like Microsoft's Edge browser, and some conductivity things to XBox and Windows 10.. No great loss there, and you are missing Continuum, another thing that won't be missed. Especially since you are gaining more things that Android has to offer over Windows 10 Mobile. The idea that those launchers that attempt to mimic the look of Windows Phone 8/8.1 or Windows 10 Mobile has the same feel is ludicrous. It is not even close to the real experience and any regular user of Windows Phone or Windows Phone notices right away. It doesn't feel right(and there are some visual things that aren't quite right), it doesn't act right because Android is underneath it and it is very apparent. That's all talking short-term. I'm talking long-term. For now, I 100% agree Windows 10 Mobile is an unfinished product. Like a building undergoing construction and still lacking a roof at this point; that's a major compromise for living in, so, I'm just renting an Android apartment for now. Haven't even bothered buying a Windows phone since it existed. However, once that building is completed, it'll be like comparing a castle a 1 bedroom apartment. It's just slowly shaping up to become my SmartPhone wish: http://www.dereferer.org/?http%3A%2F%2Fbit%2Ely%2F1Pe8PAu They still have a long way to go before I consider buying a Windows Phone, but so long as the UWP keeps growing (which it definitely is), Windows 10 Mobile ain't going nowhere. By the time the true Surface Phone lands, I'm expecting Windows 10 mobile to be equipped with all of the following: - Interactive live tiles (alternative to widgets) - Support for apps communicating with one another and enhancing one another like Dolphin extensions do on Android - Support for Apps like Tasker, Titanium Backup, etc. - Support for quick-switch profiles for multiple hardware/software components - Being used as a flash drive (not sure if Windows 10 mobile already supports this) Couldn't care less how long it takes, so long as it keeps shaping into my SmartPhone wish, I will definitely buy it when ready. No matter how advanced iOS or Android become, they'll just be meh companion devices to my Surface Pro. A true Surface Phone with Continuum on the other hand, will be my ONLY computing device, capable of seamlessly transforming between ALL 4 form-factors of a PC (SmartPhone, Tablet, Laptop, and Desktop), with 0 compromise. 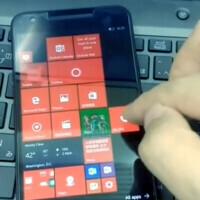 ASUS' Padfone ( https://db.tt/FNle2DAA ), Acer's Switch Alpha Fanless Intel Core i7U 2-in-1 ( http://www.windowscentral.com/hands-acers-crazy-liquid-cooled-switch-2-1 ), HP's Elite X3 ( https://www.youtube.com/watch?v=gCJ9pYuxDNc ), and the GPD WIN ( https://www.indiegogo.com/projects/gpd-win-intel-z8550-win-10-os-game-console#/ ) are all paving the way to that future, and Windows is currently the only platform practically set for this evolution to 1 computing device being practically suitable for ALL computing tasks. Windows NT and RT was never open sourced, WP is based on win RT, so it's never gonna happen. Hopefully someone can make it official so that Android devices can come to Windows 10! If people wanted WP, manufacturers would be making devices for it. This dual boot feature is therefore pointless as continuously falling market share indicates public interest in the OS is next to nil - no one would select the WP option on a dual boot phone if the option was made available. This is what I wish Blackberry would do. Give a double boot option with BB10 / Android. Ok, throw Windows on it to for a triple boot! & it will be really expensive as it will need a large amount of internal storage !! Not really, Windows allows really good use of internal storage. With a 64gb option. you can allow 16GB for each OS, then use the left over 16GB as a 'shared' storage partition for stuff like pictures etc. Treat it like an SD Card. 16GB for general OS functions is enough. Not everyone carries 128GB of videos and music. What I do have is 10TB of onedrive storage so you are right 16gb doesn't affect me, im rarely rarely without Highspeed connection. However with that said, I do like more space. Hence 16gb for OS and 16gb for a 'shared' storage for things like music, photos etc...like a removable internal hdd partition for all os to share. So if you take a pic on the Android Partition it would show up still in the windows OS as well. Now I would still want an sd card too, I have a 64gb in my phone currently. sadly my 128gb died.